I was one of those kids who built model planes and dreamed of becoming a fighter pilot. 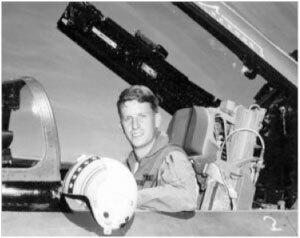 After four years in university, gaining a BA in Economics and Political Science, I entered the Air Force and became a pilot. 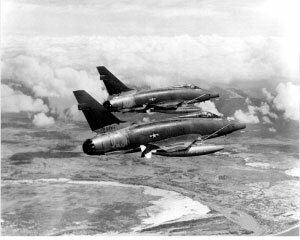 My six years in the military saw me fly combat in a number of types including the North America F-100, the Republic F105 and finally the F4 Phantom. 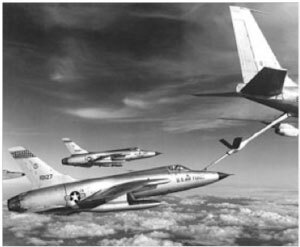 Viet Nam was an exciting period for a fighter pilot. Upon my release I thought America’s airlines were the basis for a continuation of my flying career. Five years on Boeings proved that being a bus driver was not the answer. I went back to school and earned a Masters in Economics. One thing led to another and I took up a teaching position. This led to an involvement with a church group planning projects in Haiti. I am not particularly religious, but the people’s enthusiasm and love for their Haitian friends fascinated me. One summer, with nothing to do, I travelled to Haiti with missionary volunteers. We hoped to drill water wells, improve sanitation and provide medical care. The people of Bombardopolis and Jean Rabel were some of the finest individuals I have ever met. They had very little but shared without restraint. On later journeys, we brought what we could to meet their needs. There was one commodity we could not bring in our suitcases, or ship in containers of the Antillean Line. We could not provide it via bank transfers. There was no way in which we could see that our Haitian friends got a fair diet of TRUTH along with the vitamins, antibiotics and fresh water we worked to supply. No matter what we did, there was little TRUTH in their daily life other than the fact that most of them would never live to be 50, have a productive job, or read and write. I was a neutral observer of the shortfall in TRUTH. I had no ax to grind. I had no horse in the race. I wasn’t married into a Haitian family which would automatically mean that I was related to everyone and – because of this – could not speak the TRUTH. As a foreigner, many at all levels of the society would talk to me TRUTHFULLY. (They still do.) For them to speak the TRUTH – publicly – would mean isolation, the loss of work, violence, or the need to make an escape to Miami. Haiti’s history is punctuated with personal disasters faced by stubborn, patriotic individuals who insisted on speaking the TRUTH. Olivier Nadal, ex-President of Haiti’s Chamber of Commerce, lives in exile, ignored by friends and family, because he honored TRUTH over his own personal well-being. Many have died in a futile pursuit of the TRUTH. Several years have passed, since I spent time in Haiti’s northwest and other sections of this enchanted island. I have maintained contact with my many friends via the magic of e-mail. As the days, months, years slipped past I became aware of the steepening trend towards a complete and total vacuum in the TRUTH sector of the Haitian society. Now President Rene Preval works to deliver a final Coup de Grace to a mortally wounded TRUTH. Preval has personally, and cynically supervised the final murder of TRUTH throughout the land. His mission to eliminate TRUTH has been supported by the media, local businessmen and members of the International Community – specifically the United Nations MINUSTAH in efforts to placate a new dictator. Each group has its own agenda in the suppression of TRUTH. None of these takes into account the well-being of Haiti’s 9,000,000 or the Nation itself. Yet again, the elite minority has a strong influence while the massive majority has none. The elite has a parachute in the form of American or Canadian visas. The majority lack this escape hatch and must crash and burn in the final disaster. The FLAME OF TRUTH is flickering near oblivion. A small draft could extinguish it forever, plunging Haiti into a primeval darkness. Someone must try resuscitate TRUTH so that future generations will knows its friendship. I suppose that everyone is biased, including me. However, I will do my best to provide a balanced supply of TRUTH in the hope that these small kernels will help gain a foothold in that devastated, eroded environment that was once the Haiti I loved and recall in my mind’s photo gallery. With care, and some added fuel, the FLAME OF TRUTH can be revived and used to light the path to national salvation. The Flame of TRUTH can illuminate the crimes and insults against Haiti’s massive majority. Here is some TRUTH to light the way. You can forward any small pieces of TRUTH you possess. I will add them to the flame until we create a massive bonfire that cauterizes Haiti’s wound. Only then will the patient survive. I am stunned at the information that you are providing. Why is this not being reported more openly. This is a wonderful thing to see. Hopefully, justice will befall the people there. Thank you Mr. Collins for a very informative site. Keep the news coming. My thanks to the blan who recalls Haiti and gives thought to our wounds and insults. Message de Solidarité au peuple haïtien de M. Jean-Claude Duvalier, à la suite du séisme du 12 janvier 2010. C’est avec effroi et une profonde émotion, mais aussi une très grande préoccupation, que j’ai suivi les conséquences meurtrières et dévastatrices du terrible tremblement de terre qui a frappé si impitoyablement notre pays. En ces heures de grande détresse nationale, mes pensées vont aux blessés, aux victimes, particulièrement aux enfants et à la jeunesse, à leurs familles et à leurs proches. En ce moment de douleur et de deuil, je tiens à vous assurer de ma totale solidarité, et j’adresse aux familles si cruellement éprouvées mes sincères condoléances et mes plus profondes sympathies. J’adresse également à toutes les équipes de secours mobilisées ma reconnaissance pour le travail remarquable qu’elles accomplissent dans des conditions extrêmement difficiles. Je voudrais exprimer mes sincères remerciements et encourager le formidable élan de solidarité que toutes les Haïtiennes et tous les Haïtiens du Monde manifestent , et auquel la communauté internationale s’associe pleinement. Que cette communauté soit assurée de ma profonde gratitude. Devant ce lourd et révoltant tribut , une fois de plus, infligé au Peuple et à la terre d’Haïti, la Nation toute entière doit se mobiliser pour surmonter ses malheurs. Malgré la gravité de la situation, je souhaite vous dire mon espoir et ma conviction qu’Haïti saura retrouver, grâce à une exceptionnelle mobilisation des forces vives de notre pays, avec l’aide de la communauté internationale, le chemin d’une réelle reconstruction. Je connaîs votre extraordinaire courage, l’abnégation, et les sacrifices dont vous êtes toutes et tous capables pour sauver notre pays. Les moments pénibles que nous vivons en appellent au sens du sacrifice national. Dans ces circonstances particulièrement dramatiques pour notre pays, je tiens a exprimer toute ma solidarité et mon soutien. J’ai immédiatement pris des dispositions pour qu’une première aide d’urgence d’envergure parvienne à Port-au-Prince au plus tôt, et, un important réseau de bénévoles est mobilisé pour aider la population en détresse. Aux familles démunies, aux sans abri, aux régions sinistrées, aux enfants et à la jeunesse, j’envoie un grand message de fraternité et de solidarité dans cette si cruelle épreuve. Que Dieu sauve Haïti ! Paris, le 15 janvier 2010. This is the largest registry of haitian students registered online after the earthquake that displaced many of them. Please email us at register@haitiecole.com and help students to pay for internet service as well the teachers so that they work via the net and not lose the remainder of the school year. God bless. The “truth” has been in retreat as long as I can remember. I grew up in the UK and was very optimistic about the future of the world … and the progress of science and technology affirms that optimism. But the progress of society, and the way the leaders in the professional, political and corporate realms have behaved to enrich themselves and their friends is appalling. This is an obvious problem in Haiti, and many other developing countries, but the problem is ubiquitous. Truth is vital … accountability is a component of this … and Community Analytics (CA) a method to make accountability a norm of global society. Astounding man! A lot of your stuff is really Brilliant. Thank you very much Michael Collins for this site. I would like to know though…why there can’t be much done about it? WE definitely cannot speak the truth (and we know it) and even if we do…what then? Who will be on our side? The mass majority have the power to retaliate if they knew “the truth” but who is willing to go out there and tell them? And will they beleive this person? The only way for these people to get the life they deserve is if major change happens…AND FAST! The country is being raped and has been raped from Government to government. The people left with no parachute are brainwashed (esp since they are not educated) by the government. Please give me some hope that things will change and how they could change. The only thing left on my mind is…GOD PLEASE MAKE ANOTHER COUNTRY TAKE OVER! Please send me your insight. Considerably, the post is in reality the greatest on this deserving topic. I agree with your conclusions and will thirstily look forward to your future updates. Saying thanks will not just be adequate, for the exceptional lucidity in your writing. I will at once grab your rss feed to stay abreast of any updates.Gratifying work and much success in your business dealings!Thank you. Je me permets de suggérer à Haiti-truth.org d’enlever l’image de l’enfant mort qui apparait en ouvrant le site. Même si c’est le cadavre d’un enfant, on doit avoir du respect pour sa dépouille. D’ailleurs la façon dont le corps est transporté me parait insupportable. C’est une image plutôt dégradante qui ne fait honneur à personne. Je la trouve plutôt extrêmement choquante et chaque fois que j’ouvre le site, je me sens repoussé par son apparition sur l’écran. Je ne crois pas que je suis le seul à éprouver cette sensation. Le souvenir de cette catastrophe à Cabaret ne cesse de nous hanter l’esprit. Donc le fait de revoir cette image désastreuse à chaque instant me parait encore plus pénible. Your Site is a source for anyone in need of information on the current events in Haiti. Vi è, ovviamente, molto da sapere su questo. Penso che hai fatto alcuni buoni punti in Caratteristiche also.Keep di lavoro, grande post! We share the opinion on and I really enjoy reading your article. great blog, bookmarked it to show my friend :)! New to this site, the position here is rare and somewhat refreshing. I agree with many views you put forth. The plight of this country is caused by many forces, but my opinion is that the worst injustice has been to create a dependent society and an environment in which engineering incoming aide has become a full time job. There was a time when the farms of this country exported food to sell in foreign markets. Now nearly all the supply is imported from foreign markets. I am not particularly religious but to borrow an analogy, part of this recovery should involve teaching this country to fish instead of continuing to give it fish. Without this there is no future. Thank you for this incredible resource from one Airman to another. I would like to speak with you about a speaking engagement. Please contact me at ***-***-**** or via email. I’m a co-editor at Before It’s News. Our site is a People Powered news platform with over 1,000,000 visits a month and growing fast. We would be honored if we could republish your blog RSS feed [http://www.haitian-truth.org/feed/]. Our readers need to read what [http://www.haitian-truth.org/] has to say. Syndicating to Before It’s News is a terrific way spread the word and grow your audience. Many other organizations are using Before It’s News to do just that. We can have your feed up and running in 24 hours. I just need you to reply with your permission to do so. You can also have any text and/or links you wish appended to the end or appended to the beginning of each of your posts on Before It’s News. You can if you like create a custom feed for Before It’s News that includes multiple links back to your blog or web site. We only require that RSS feeds include full stories, not partial stories. We don’t censor or edit work. I wonder how many realize exactly how good your presentation of facts is. You have the most balanced selection of material on the internet, giving space to all viewpoint, even if they might conflict with yours. Your web site is also an attractive one that makes people want to open an article and see more. Thanks again, from an old Haitian who has lived through all of the governments from Estime to Preval. Preval will go down in history as the very worst thing to happen to Haiti. The MINUSTAH people picked him. The Haitian people would never do this in a truly free election since they hate the man. The international community inflicted this criminal upon us. They should now move to remove him and let the nation survive. The so called (Elite class) of Haiti has to stop turning a blind eye on the minorities because they have been exploited for too long , furthermore we all have to understand that when other nations critized our nation ,they are not only talking about the minority but as well as the rich one . The seisme was a wake up call , it is time to reconstruct our nation for the better , and to distibute the wealth of the country proportionately . Hello Michael, Big fan of your site. I work with a production company in **** and was hoping to get in touch with you. Could you provide your contact info for me? Thanks. I have been searching for information on Haiti since January and I have just happened upon your site, thank you for all the information and history you have given here which I have found so interesting and useful. I am hoping to volunteer in Haiti later this year and am eager to learn as much as I can about Haiti and its people. Please keep covering everything and anything that you feel is relevant to your readers. Thanks again. I can’t believe my good fortune at stumbling across this site! I have done nothing for the last several days but read and absorb the information you have gathered and shared. Speaking as someone whose heart was captured by Haiti over three decades ago, I am thrilled to have found so much information complied in one place about the country that I love. I wish I had found it earlier as I have often been frustrated by the lack of honest information available. I have even included a link to your site on my own and hope everyone who visits my site will also visit yours! I like your blog and we have attached it. Haiti needs more of us. I don’t know if you live in Haiti or personally experienced the earthquake, 1943 hours, January 12, 2020. I was there and suffered a broken arm, which is nothing when one understands that almost 500,000 (not 230,000) lives were lost. Over 250,000 homes were lost. Over 50,000 people lost limbs (not 3,000). I attended a memorial servive as Tetanyen, on the road between Port-au-Prince and St. Marc where something over 50,000 were bried in a common grave, dumped there by the truckload, anonymous and unidentified. Already, the world has forgotten those who died. The people in Haiti now overlook the mass of Haitians who lost limbs. Haiti is a country with little for the handicapped. So long as our site illustrates the tragic loss, someone will remember. Perhaps, a few like you will complain….but, at least, you were forced to remember. Already the hurricaen season is upon us and survivors of the Janvier 12 disaster face floods and disease….little better off than they were 7 months ago. We must be reminded in order to remember. Leave the photos where they are. Better and better it get all the time. Thank you for this site, hope you have a team to help maintain it for the long term. In Haiti we do not seem to think past the present, we are a people that lives in the moment. Also Mr Collins, may I suggest you include a page that provides the speeches made by the current Haitian president and future presidents. Thanks…. THANK YOU FOR THE REVELATION ON NEPALESE CHOLERA CARRIERS FROM MINUSTAH. FOR ONCE HAITIANS WILL NOT BE BLAMED FOR FOREIGNERS MISTAKES OR ACCIDENTAL INTERVENTIONS. OR….IS THIS A MINUSTAH PROJECT TO CANCEL ELECTIONS????? We have been offering and communicating with all groups including the UN, USAID, Clinton Foundation, IHRC, IOM, Red Cross and many others since January 15, 2010 offering a significant building system, designed specifically for this Haiti disaster, including jobs for Haitians through our NGO, Prizm Foundation. I must herein pay respect to the very few international contributors that have actually come through with their pledge for Haiti. Perhaps those Nations can make a call to action, designating some of their contribution, to build these buildings which are easily produced in very large quantities. I have actually been told by one camp director that, regarding shelter, “a decision has been made and is cast in stone, that no one camp will be any better than any other.” To me this means that no camp is going to be any good at all. We are able to help in Haiti, but the large organizations having received the bulk of donations must spend the money on decent shelter. We can provide the least expensive, most durable buildings for schools, clinics, shelter etc. Buildings are temp or permanent. Our program engages directly with the people of Haiti, with Haitian partners. Our template could be scaled and repeated all over the country in a few months with proper support. We will collaborate with any group interested in fast tracking this shelter, job, education, and sustainable relief effort. Please forward this to any group you think should have it. We have been trying to collaborate with the large NGO’s since Jan 15. We seemingly get nowhere, no return on phone calls or email. With great difficulty we are raising funds right now with our partner Racine Kreyòl Cultural Arts for the Families2Families program in Cabaret, Haiti. We expect to be sending a number of buildings soon and will be demonstrating how a mass housing program for transitional shelter could be accomplished in Haiti very quickly nationwide. Our nonprofit registration in Haiti should be accomplished in a few weeks. Our project in Cabaret with Haitian partners, is a 10 acre relocation camp with a number of our VertexTM buildings. We also have 8 buildings funded by a private company going to Cap Haitien in about 5 weeks. Info is available on our website, http://www.prizm.org Our plan is to also start a fabrication/staging area facility for building jobs in Cabaret, Petion Ville and other population centers. Perhaps you have some ideas? We are 501c3 and registered with US CCR. The VertexTM Building System is Unique in the world. No other building system addresses the criteria in Haiti in such a comprehensive manner. The ability to quickly relocate these buildings addresses the issue of land ownership currently interfering with T-Shelter locations as well as building in general. We have extensive knowledge of disaster situations and the VertexTM Building System erects a building in several hours with roof raising in about 1 minute. It is as very sturdy building designed specifically for Haiti. Feel free to contact me at anytime to explore collaboration on sustainability and addressing the housing conditions currently being endured in Haiti. We have a number of solutions for T-shelter, Permanent housing, Schools, Evacuation shelters and Haitian job creation. We can produce 1000’s of these buildings very quickly including Haitian job creation in the process. We address the severe need for shelter while the longer term rebuilding efforts are being planned. As valuable as the 5 – 10 year rebuilding plans currently under consideration are, I spent time in Haiti with people and in particular children that would not live to see these plans materialize. Small level of support through collaborations could move our program along very rapidly and save many Haitian lives. I am available at any time if you wish to contact me, from your writing it seems like you might be of significant help, I am sure there are many small grassroots organizations that are completely eclipsed by the large organizations as well.